t*rexes and tiaras: Another knitted robot.. I guess the clue is in the title for this one. 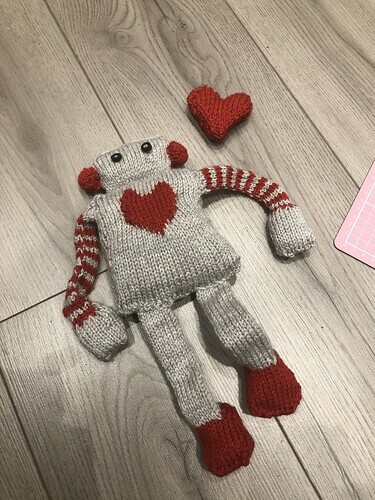 Looking at the last knitting projects I seem to have shared, it certainly looks as though I have a bit of a knitted robot obsession. I mean, I do love robots but I guess it's also worth pointing out that neither the blanket nor this little guy are for me. A couple of weeks ago I was scouring Ravelry (does anyone else get absolutely lost in there?!) for something heart-themed for Valentine's day. 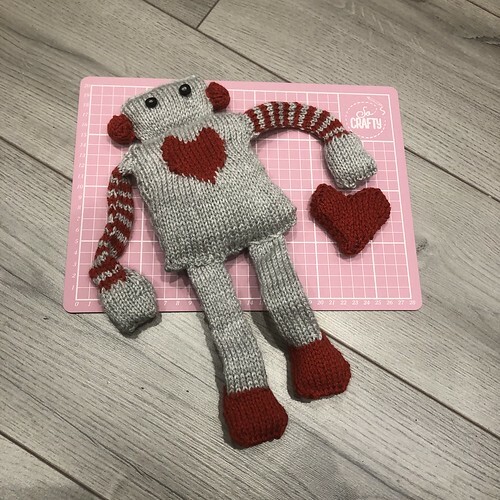 Eventually I settled on this pattern - Louie the Lovebot - which I've had saved in my favourites list for an absolute age. I'd been making a cable knit scarf in a grey DK which I'd picked up from a discount store recently, and had some left over, which made my mind up that one of the colours in my robot would be grey. Since the intarsia heart on the front had to be in a contrasting colour, I decided on red. It seems to fit the Valentines theme. The pattern itself was quite easy to follow, although I got about halfway through and decided that I couldn't get the magic loop thing right, so switched to DPNs. I think that my problem was that the circular needles I was using probably weren't long enough, so I was finding it a bit of a struggle to loop it properly. I also found that my heart came out a little wonky - it's knitted in intarsia in the round and I think my tension between colour changes was a little off. I fixed this once I'd stitched him up by adding a few little stitches to sort out the shape. Hopefully it's not too noticeable. 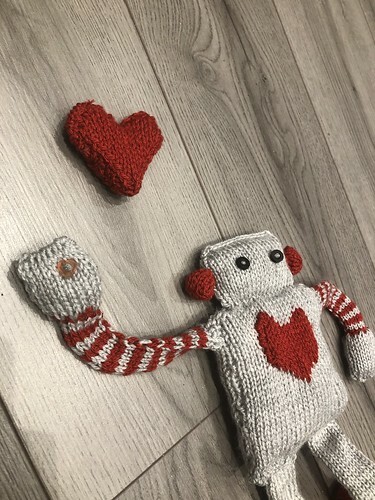 I finished him off with a couple of button eyes and a little heart button in his hand so that he can spread some love. I think a larger button might have worked better for this but I was using up some from the button jar and this was the best I could find. I'm enjoying using up leftovers and working my way through my yarn stash (although I have to admit I did add to it recently when a local charity shop got a huge donation from a wool shop which had closed down). 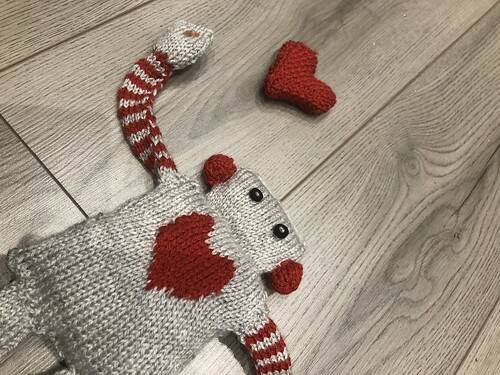 The little knitted heart was made using this free pattern from Studio Knits and it was so simple that I would definitely make more; perhaps as a string of bunting or something? That's so cute! Well done you! Thank you - your knitted menagerie is amazing, too! I do think he is wonderful! Thank you, he was a well-received gift.